The Federation of European Motorcyclists Associations – FEMA gives an insight from inside the Motorcycle Working Group Meeting (MCWG) held in Brussels on Friday 16th September. Our own report – Moving The Goal Posts – Click Here – says, when we similarly reported that: “We have to agree with ACEM – at the MCWG meeting on Friday, their representative told the Commission and members with regards to the timetable for implementing the proposed regulations that the revised Commission proposal was “a Nightmare Scenario” and commented that the Commission was “changing the rules in the middle of the game. As the European Parliament and the Council of Ministers start looking into the new type-approval regulation, its original author, the European Commission, tries to throw in some last-minute changes and revealed some interesting insights in anti-tampering research. FEMA attended the stakeholders’ meeting on Friday, and deciphers the legal and the technical for riders. The Commission treated representatives of the Member States and interest groups to additional information on its regulation on the type-approval of motorcycles on Friday, during a Motorcycle Working Group Meeting (MCWG) in Brussels. The working group, a platform for information circulation and stakeholder input, had not convened since January, and its members awaited eagerly the results of investigations on technical aspects of the regulation, mostly on durability and engine tampering, commissioned for the occasion. The new type-approval regulation, a recast of existing directives with additional requirements in terms of safety equipment, environmental performance and market surveillance, was presented late last year and has been a point of interest for FEMA and its members ever since. The current draft, proposed by the Commission, is now under scrutiny of the Parliament and the Council of Ministers, who can amend the text before taking a final vote that will turn it into law. Until then, everything is possible. The general principle in European Union law is that the European Commission is in charge of drafting proposals for new laws (directives and regulations), which are then handed to European Parliament and Council of Ministers for amendments and approval by vote. Once the text lands on the MEPs’ desks, it ceases to be the Commission’s brainchild and starts a life of its own. This is why it came as a surprise to everyone involved that the Commission forwarded to the Council of Ministers a “clarification” last week, in the form of an updated calendar for the implementation of emissions control measures, different from the proposal currently discussed. The new suggestion basically moves forward by one year all the dates for the introduction of Euro 3 and Euro 4 emission regulations for motorcycles. The motorcycle industry promptly reacted, claiming that the Commission is “changing the rules in the middle of the game”. ACEM, the association of motorcycle manufacturers, complained from the beginning that the original calendar for the introduction of the various environmental (on-board diagnostics, durability, CO2 labelling, sound levels) and safety (automatic headlamps on, ABS/CBS) requirements was unrealistic, extremely tight, and would result in high adaptation costs for manufacturers. The Commission’s latest “clarification”, halfway through the legislative process, is apparently even more threatening, prompting ACEM to call it a “nightmare scenario”. 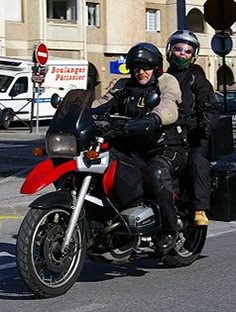 An example: all motorcycles put up for registration by January 2014 should comply with Euro 4, the technical details of which are expected to be published by the Commission… in December 2012, at best! This would leave all motorcycle manufacturers just over one year to design, develop and put in production new engines and new motorcycles, while selling their entire stock of previous-generation vehicles. Aline Delhaye, General Secretary of FEMA, took the floor during the meeting to request an explanation from the Commission, voicing the users’ opposition to any measure that would unnecessarily create additional costs for the manufacturers, and therefore, for users themselves. In particular, FEMA alone came in support of small manufacturers, who would be hit the hardest by an overly tight schedule, and the massive investments required to cope with it. Should they disappear, it would mean less choice for the consumer, less variety and innovation, and a market more closely concentrated into the hands of large companies. Questioned by FEMA and the industry, with the support of FIGIEFA, ETRA and FIM, the Commission claimed that the calendar was now in the hands of the Parliament and the Council, as it should be, and that it was merely “suggesting” a new calendar for the reflection of the Council of Ministers. Among its “clarifications”, the Commission asked the Parliament and the Council to keep their changes, in the form of amendments, within the scope of the regulation – type-approval and market surveillance. In particular, the European executive asked not to include irrelevant topics such as protective clothing, licencing and training, periodical technical inspections, or day-glo clothing for riders. The role of the Commission is certainly not over at this stage. In line with the usual practice, the regulation contains provisions for leaving the more technical aspects of type-approval to the Commission, once the Parliament and Council have voted on the general principles. This is meant to save MEPs the trouble of dealing with very technical and administrative points, which in Member States are likewise left to the government’s civil servants. In order to prepare such “delegated acts” the Commission ordered a report from an independent source on durability of exhausts and anti-tampering measures.The conclusions of the UK Transport Research Laboratory (TRL) were presented at the meeting on Friday, in the hope of gathering input from participating interest groups, including FEMA. The report tried to answer the question of how to measure the durability of exhausts. The regulation gives durability thresholds for exhausts on motorcycles and scooters, but how do we go about testing if the products comply? TRL compared three test cycles, the US EPA, the European SRC used for passenger cars, and an entirely new cycle; in order to find one that best represents actual use on roads. The best solution was deemed to be a motorcycle version of the SRC, using elements from the existing World Motorcycle test Cycle (WMTC) with soaks and cold starts. This combination is expected to provide challenging deterioration with high speeds while reflecting real-world use. TRL was also commissioned by the European Commission to report on engine and powertrain tampering, and suggest anti-tampering measures. 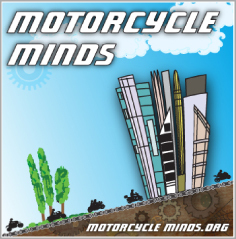 You may remember that TRL chose to ask for advice from the user community, albeit in an original way: by launching a contest asking “schools, colleges, universities and rider associations” to send in their tips and tricks to boosting the power output of their favourite motorcycle, moped, scooter or… mini-car. 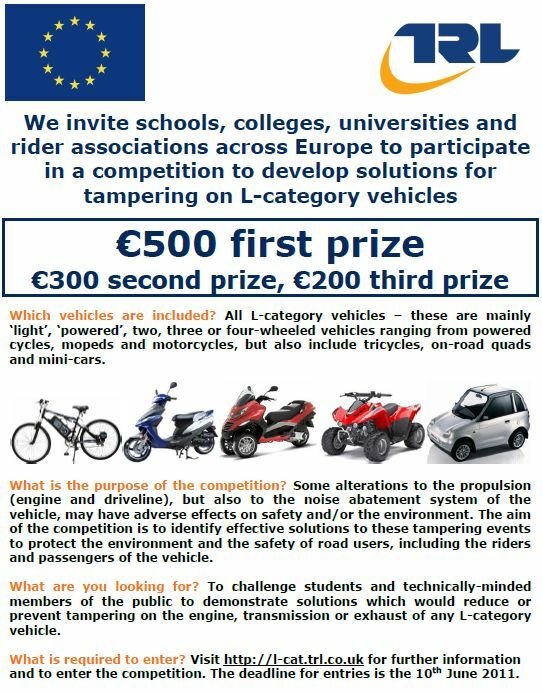 The ethical problems quickly piled up, not the least being the promotion of a public contest of how best to make your bike dangerous to ride, or the promise of a handsome 500€ reward (300€ for second place) from the taxpayer’s pocket to the first person who does TRL’s work for them. Despite a deadline extension, the initiative did not yield any results..The laboratory nonetheless came up with a report detailing the nature and extent of two-wheeler tampering, and possible countermeasures to be included in EU legislation. The report develops a methodology for determining what kind of tampering is more harmful and should be prevented in priority. It uses a simple system: for each type of tampering, the effects on safety, environment and noise are rated. Then it adds the effect on safety, the effect on environment and the effect on noise, and multiplies the resulting sum by a rate of occurrence and a rate of detection. The resulting number is compared to the results for other types of tampering to resolve priorities. Interestingly, when asked by FEMA how TRL knows the occurrence rate of a certain type of tampering, the TRL representative said “occurrence is difficult to know, so we often use guesses”. You read that right: current state-of-the-art research on engine modification is based on guesswork. And there is no indication that TRL’s guess is better than anybody’s. It seems obvious that despite its best efforts, the Commission cannot find evidence that tampering is either widespread or significantly harmful. The last nail in the coffin of anti-modification was driven by the representative of TRL himself, who added that they do not know the whole extent of the problem, which will make it difficult to assess the effectiveness of anti-tampering measures if they are ever implemented. FEMA took the opportunity to remind the Commission and TRL that riders already pointed out earlier that harmful tampering, in their view, only concerns a small minority of users, and that it is and should remain a law enforcement problem to be solved on the member state level. Therefore, it should not be a priority, and it certainly doesn’t warrant far-fetched technical regulations that would negatively affect the vast majority of safety-conscious, law-abiding motorcyclists. The meeting was also an opportunity for the Commission to introduce its calendar for the discussion, drafting and publication of three delegated acts covered by the type-approval regulation: the Regulation on Environmental and Propulsion Performance (REPPR), Regulation on Vehicle Functional Safety Requirements (RVFSR); Regulation on Vehicle Construction Requirements (RVCR) and Regulation on Administrative Requirements (RAR). The first of these, which covers critical aspects of engine building and vehicle performance such as tailpipe emissions and fuel evaporation limits, was first shown during the meeting, but the Commission expects interest groups to make comments and to request changes before October 28th. A rather tight schedule, considering the draft is only 387 pages long! The deadline for the second, covering safety elements, is barely longer, with input expected by mid-December. The motorcycle industry, with a lot at stake, loudly complained that the timeframe was too short to provide anything meaningful. Is it a deliberate strategy on the Commission’s part? Or is it just that the schedule for the implementation of the regulation is too short, as FEMA noted from the beginning? The next meeting on September 22nd will gather emissions experts, and another on September 23rd will look at the reassessment of environmental requirements. Meanwhile, the rapporteur at the Internal Market Committee, MEP Wim van de Camp, will meet with representatives of other political parties to discuss the regulation by the end of this month; in view of the vote of the Committee, now postponed by two weeks to October 17th. The plenary reading, where all MEPs will be invited to contribute, is expected for November or December. The next Motorcycle Working Group meeting is planned for mid-December, and FEMA will be there.